Do you want to make a historically-authentic Rock and Rye? I serve Rock and Rye giving the whiskey and the syrup separately so that the drinker can mix it however sweet they like. The drink seems pretty straightforward. Rye whiskey served with rock candy syrup is Rock and Rye. It was good treatment for a sore throat because the alcohol in the whiskey is both antiseptic and temporarily deadens nerve endings, temporarily killing the pain. The rock candy syrup, being the heaviest-possible suspension of sucrose in water, makes the drink viscous enough to coat the throat long enough to do its alcoholic work there better. Volume eleven of the Bulletin of Pharmacy in 1897, specifies that when cooking the syrup from which rock candy will be produced, no temperature higher than 112º Fahrenheit should be allowed. The 112º Fahrenheit limit is kept to prevent the conversion of sucrose into invert glucose. Some amount of conversion from sucrose into glucose may be considered acceptable by some people making simple syrup, but it isn’t okay for the production of rock candy. If you want to produce rock candy, you’d best stick to low temperatures and pure sucrose and pure water — in super-saturation so that rock candy will form. Once all of the excess sugar has crystallized out, you will have rock candy syrup. So, rock candy syrup and buttermilk have this in common: they were both traditionally the stuff left-over after the making of the named thing (rock candy or butter), but are now routinely divorced from those processes and are simply compounded independently. Notice that, according to some of the above sources, it seems to have became common for other types of syrup to be sold as rock candy syrup. Perhaps the growing difficulty in getting authentic rock candy syrup led to some bars serving an altogether different drink when asked for Rock and Rye. Such recipes as those below make up a tiny minority of published recipes for anything called Rock and Rye, but they do exist. Note that the above drinks would not relieve a sore throat very well, being without the thick viscosity of actual rock candy syrup. 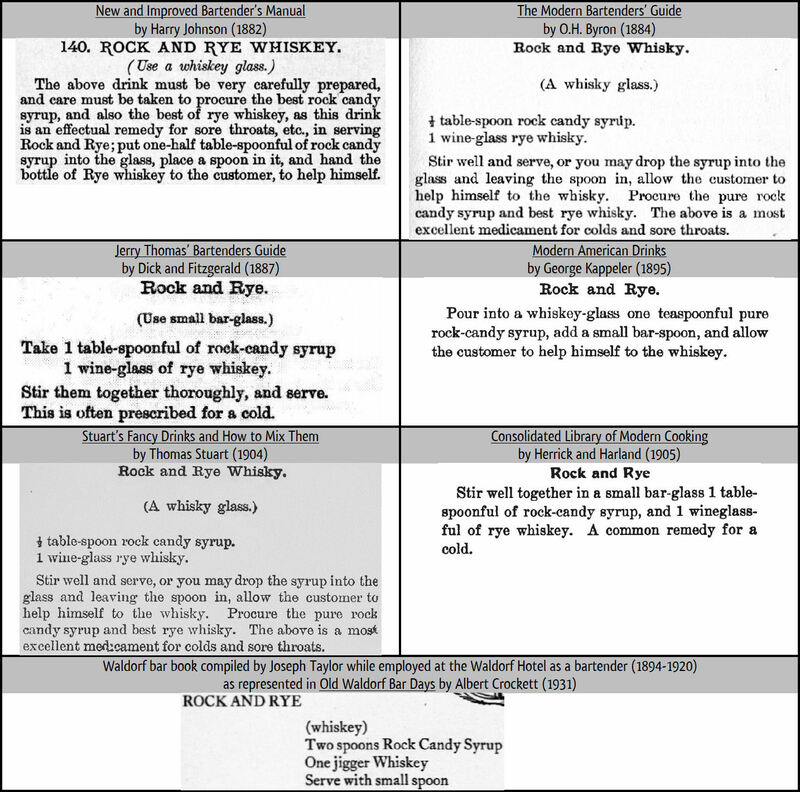 One of the sources, William Boothby, was apparently spoken to so much about the Rock and Rye recipe in his 1891 book that he dramatically added to it for his 1908 book. But what about the syrup? Has authentic rock candy syrup become available again? The above ingredients for Amoretti brand so-called ‘rock candy syrup’ show that, though it may be a heavy syrup, it is definitely not traditional rock candy syrup. Traditional rock candy syrup would not contain dextrose or fructose. Genuine rock candy syrup carefully contains only sucrose and water. Why it would need dextrose, fructose and “natural flavor” is a mystery to me! So, what if you want to have traditional rock candy syrup? Some old sources state that one of the reasons for the production of so much imitation rock candy syrup is that making the real thing via rock candy production takes time. Unfortunately, that is true. But, if you don’t care how much rock candy you make, the time needed can be drastically shortened. Bring one part (by volume) distilled water to a temperature as close as possible to, but not higher than, 112º Fahrenheit. An induction cook-top (like this one) that can be set at exactly 110º Fahrenheit is really useful. Add three parts (by volume) pure, refined sugar (sucrose). Stir over the same heat (never exceeding it!) until the sugar is dissolved. It may take some time. Pour the syrup into mason jars. If you want to harvest the rock candy instead of discarding it (stuck to the inside of the jar), suspend a string in the mason jar to which the rock candy will form. Once no more rock candy forms inside the syrup, pour it from the mason jar into a syrup bottle. This syrup will contain the highest possible amount of sugar in a stable solution. It will be the closest thing to genuine and traditional rock candy syrup that you will have ever had.